Liverpool failed to build on their midweek triumph at Leicester City after a drab home draw with Sunderland. Steven Gerrard was rested, perhaps with one eye on Tuesday's must-win Champions League game with Basel, but the hosts struggled without their captain. Wes Brown and Connor Wickham wasted decent chances for the well-drilled visitors. Liverpool's Raheem Sterling had a late penalty appeal turned down but Sunderland were good value for a draw. It took the home side 17 minutes to win their first corner and it was a further six minutes before they registered their first effort on goal, when Rickie Lambert headed well wide and combining with former Southampton team-mate Adam Lallana. Liverpool were missing Gerrard's drive and, when he was sent out to warm up by Rodgers before the half-hour mark, he was met with rapturous applause from a previously slumbering crowd. Things could have got a lot worse for the hosts when, in the last action of a turgid first half, Brown rose unmarked to meet Sebastian Larsson's corner, but the former Manchester United nodded the glorious chance over the bar. The visitors came out firing after the interval and should have taken the lead when Wickham, unmarked at the far post, volleyed a half-cleared Larsson corner wide. Rodgers had seen enough and sent on Gerrard for Lallana after 67 minutes. Almost immediately, Sunderland boss Gus Poyet introduced Lee Cattermole for Larsson to stifle the threat. Liverpool began to exert belated pressure and Sterling, set free by Gerrard, teed up Philippe Coutinho. But his low effort was saved by a previously redundant Costel Pantilimon. Jordi Gomez had a long-range shot held by Simon Mignolet after a Sunderland break, while Sterling went down looking for a late penalty but his appeals went unheard. Building will begin on expanding Liverpool's main stand on Monday and it appears that Rodgers also has a lot of work to do on the pitch. His men, missing the injured Daniel Sturridge, are now ninth in the Premier League table, four points adrift of fifth place. A week that started so well for Poyet's charges with a creditable draw at Chelsea has ended the same way thanks to another resolute performance that leaves them two points clear of the drop zone. Liverpool manager Brendan Rodgers: "I thought the players gave everything and in the second half. They needed a wee bit of luck and it didn't come. "If you can't win it's important you don't lose. We've taken seven points from nine this week which is a good return for us. Sunderland manager Gus Poyet: "I think there are times in life when you get opportunities. Today we lost a great opportunity to win at Anfield. "In terms of defending and keeping a clean sheet we went back to the basics. "We need to score more goals and be more clinical. The most important thing is to win and at the moment we cannot win too many." Match ends, Liverpool 0, Sunderland 0. Second Half ends, Liverpool 0, Sunderland 0. Attempt blocked. Lazar Markovic (Liverpool) left footed shot from the centre of the box is blocked. Assisted by Rickie Lambert with a headed pass. Attempt missed. Jordan Henderson (Liverpool) right footed shot from outside the box is high and wide to the right. Attempt blocked. Raheem Sterling (Liverpool) left footed shot from the centre of the box is blocked. Assisted by Lazar Markovic. Attempt blocked. 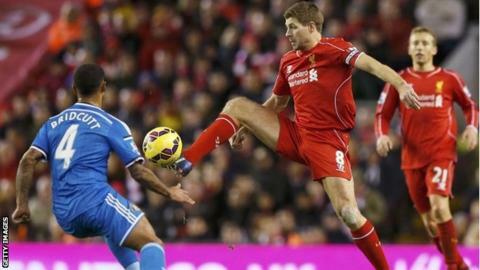 Steven Gerrard (Liverpool) right footed shot from outside the box is blocked. Assisted by Lucas Leiva. Hand ball by Jordi Gómez (Sunderland). Attempt blocked. Jordan Henderson (Liverpool) right footed shot from outside the box is blocked. Assisted by Raheem Sterling. Corner, Sunderland. Conceded by Simon Mignolet. Attempt saved. Jordi Gómez (Sunderland) left footed shot from outside the box is saved in the bottom left corner. William Buckley (Sunderland) is shown the yellow card for a bad foul. Foul by William Buckley (Sunderland). Substitution, Sunderland. William Buckley replaces Adam Johnson. Substitution, Liverpool. Lazar Markovic replaces Philippe Coutinho. Offside, Sunderland. Wes Brown tries a through ball, but Ricardo Álvarez is caught offside. Attempt saved. Philippe Coutinho (Liverpool) right footed shot from the right side of the box is saved in the centre of the goal. Assisted by Raheem Sterling. Attempt blocked. Philippe Coutinho (Liverpool) right footed shot from outside the box is blocked. Assisted by Rickie Lambert with a headed pass. Hand ball by Philippe Coutinho (Liverpool). Substitution, Sunderland. Lee Cattermole replaces Sebastian Larsson. Substitution, Sunderland. Ricardo Álvarez replaces Jozy Altidore. Offside, Liverpool. Steven Gerrard tries a through ball, but Martin Skrtel is caught offside. Steven Gerrard (Liverpool) wins a free kick on the left wing. Substitution, Liverpool. Steven Gerrard replaces Adam Lallana. Jordi Gómez (Sunderland) wins a free kick in the defensive half. Attempt missed. Philippe Coutinho (Liverpool) right footed shot from outside the box is high and wide to the right. Assisted by Adam Lallana. Attempt saved. Lucas Leiva (Liverpool) right footed shot from outside the box is saved in the bottom left corner. Assisted by Raheem Sterling.